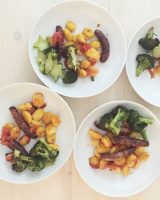 AKA ‘easy dins for little ones when the mums need to get on the wine and chat fast.’ I first made this roast sausage gnocchi when my frazzled friend was over with her children one Friday after school. It remains one of the easiest recipes and most quickly gobbled dinners I’ve made this year. I was exhausted from a week of cooking, so instead of making gnocchi in a tomato sauce as I’d planned, I threw everything in the oven together so that it could cook while the children played and we cracked open the wine. Most of my recipes come from similar (although not always wine-fuelled) changes of plans. I’ve never had a reaction to a recipe like the one I had to this. People were stopping me at the school gates and leaving messages on social media, tagging all their friends, saying how much they and their children loved it. Months on, I get a few people a week telling me this roast sausage gnocchi is one of their weekly dinners. It struck a cord for how many of us feel at the end of the week. So I’m finally typing it up properly so that everyone, even the social media avoiders can get in on the action. I buy the 500g bag of Waitrose essential gnocchi from near the fresh pasta. Most supermarkets sell an own brand fresh gnocchi. In the US buy fresh gnocchi from Whole Foods or use the De Cecco long life gnocchi from most supermarkets. Trader Joe’s do a good long life gnocchi or a frozen cauliflower gnocchi (in a 12 oz bag) too. I buy them from Sainsburys, Lidl or Waitrose. In the US you can get them at the Whole Foods meat counter. If you can’t find chipolatas, just get regular sausages from the meat counter and squeeze them so they are thinner – it just means they cook faster. Or you can use scissors to chop fatter sausages into pieces – say 4 pieces from one sausage, so they’re like mini meatballs. 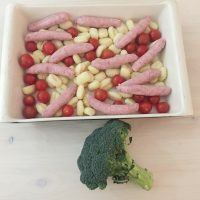 If you are using chicken or vegetarian sausages, just have a look at the cooking time and maybe add them half way through the gnocchi cooking time if they usually cook quickly as otherwise they may dry out. 3 handfuls of cherry tomatoes and a head of broccoli, chopped into florets. Or use tenderstem broccoli or green beans. 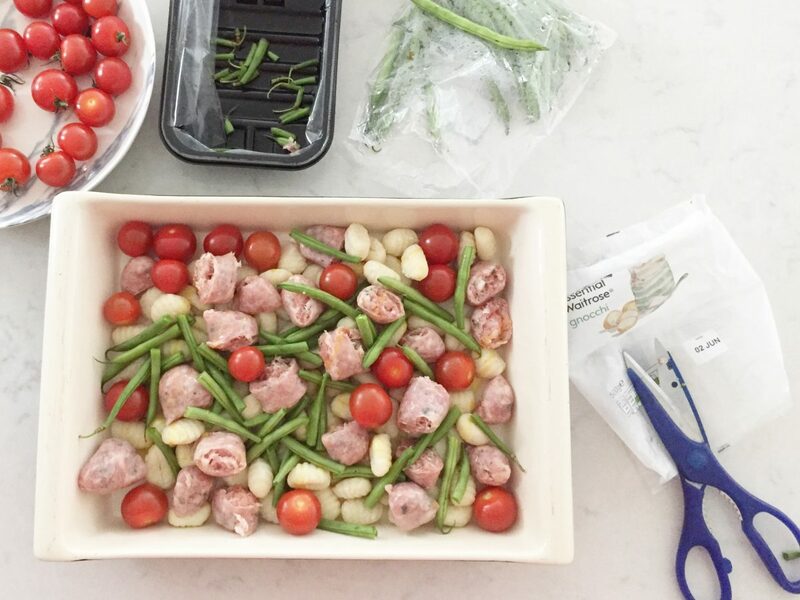 Toss the gnocchi, sausage, greens and tomatoes in a large ceramic lasagna dish with a drizzle of oil. If you cook this on a flat tray it will dry out much faster and you’ll lose the sauce from the tomatoes. The greens will go pretty crispy and dark. If you prefer them to be softer, add them half way through cooking. Shake it about then chuck it (that’s how casual we’re being) in a hot oven 180°C fan (200°C regular) or 360°F convection (390°F regular). 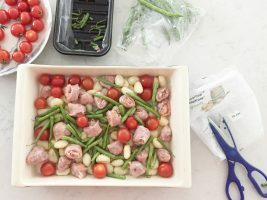 Cook for 30-40 minutes, shaking it once half way through, until the sausages are golden, the tomatoes pop and the gnocchi goes both crispy and soaks up the juices. Finish with a sprinkle of red wine vinegar – essential this bit to brighten things up. You can add some Parmesan if you like. Job done. Find more recipes for sausages, broccoli and pasta here.